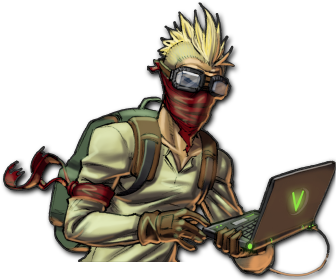 Once a brilliant scientist working alongside the infamous Dr. Vasches, Tripp is now little more than a rampaging maniac. With his mind shattered after enduring countless experiments of Vasches, Tripp has wandered the digital frontiers for ages beyond understanding. He often finds himself fighting along the forces of the Nanomei, though he is not above crushing skulls for anyone willing to hire him. He is best where the fighting is the thickest.